Comparing AO-Design Patterns Implementations. Quantitative study that compares aspect-based solutions for the GoF patterns in AspectJ, Compose* and CaeserJ. 1 Comparing AO-Design Patterns Implementations. Quantitative study that compares aspect-based solutions for the GoF patterns in AspectJ, Compose* and CaeserJ implementations. Based on the modularity attributes: Separation of Concerns, coupling, cohesion and size. Motivation –There are some AspectJ implementations that in our previous studies they did not obtain good results. Our study is a oportunity to analise how CaeserJ can improve its modularity attributes. –Implement a library containing GoF design patterns in CaesarJ. 3 Steps Implement low rated design patterns in CaeserJ Evaluate the CeaserJ implementaions in OpenOrb, a middleware platform based on reflection and component technology. Discuss if there were any significant improvement. Answer questions like: CaeserJ bindings can be useful to improve the SoC instead of intertype declarations in design patterns context? Complete the 23 GoF design patterns implementations in CaserJ providing a library. 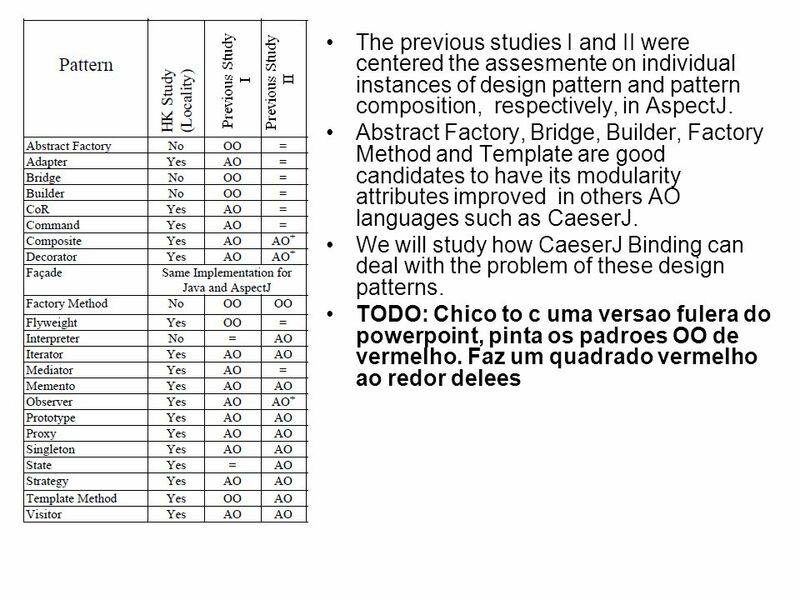 Download ppt "Comparing AO-Design Patterns Implementations. 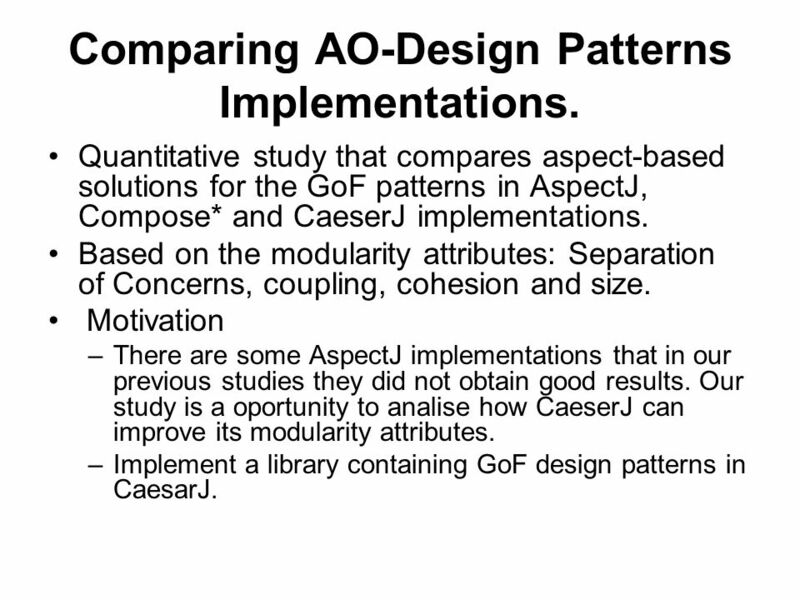 Quantitative study that compares aspect-based solutions for the GoF patterns in AspectJ, Compose* and CaeserJ." Aspect Oriented Programming. AOP Contents 1 Overview 2 Terminology 3 The Problem 4 The Solution 4 Join point models 5 Implementation 6 Terminology Review. 18-1 Verifying Object Behavior and Collaboration Role playing – the act of simulating object behavior and collaboration by acting out an object’s behaviors. Design Patterns for Object Oriented systems CSC 515 Ashwin Dandwate. Patterns Reusable solutions to common object-oriented programming problems When given a programming problem, re-use an existing solution. Gang of Four. Fall 2009ACS-3913 R McFadyen1 Design Patterns (GoF) contains the creational patterns: Abstract factory Builder Factory method (Simple Factory) Prototype. 05/26/2004www.indyjug.net1 Indy Java User’s Group June Knowledge Services, Inc.
(c) 2009 University of California, Irvine – André van der Hoek1June 13, 2015 – 21:42:16 Informatics 122 Software Design II Lecture 8 André van der Hoek. ASPECT ORIENTED SOFTWARE DEVELOPMENT Prepared By: Ebru Doğan. Design Patterns. What are design patterns? A general reusable solution to a commonly occurring problem. A description or template for how to solve a problem. Fall 2009ACS-3913 Ron McFadyen1 idea was first put forth by Christopher Alexander (1977) in his work on architectural design principles a pattern is a.
Feb. 23, 2004CS WPI1 CS 509 Design of Software Systems Lecture #5 Monday, Feb. 23, 2004. Dept. of Computer Engineering, Amir-Kabir University 1 Design Patterns Dr. Noorhosseini Lecture 2. (c) 2010 University of California, Irvine – André van der Hoek1June 29, 2015 – 08:55:05 Informatics 122 Software Design II Lecture 8 André van der Hoek. Alternative Architectures: Inversion of Control Mike Hadlow mikehadlow.blogspot.com.